The city of Antigua in Guatemala is thought to be one of the most outstanding and well maintained colonial cities throughout 'Spanish America'. Antigua is a city located in an unusual but stunning setting being overlooked by a volcano. The city is steeped in history that is just waiting for visitors to discover. Teen Spanish courses, salsa dance lessons offered. School info: Comfortable learning environment with small classes, some outdoor classes, common area for mingling. Antigua nestles in a highland valley called the Panchoy Valley and is overlooked by the imposing volcano Agua which sits some 3,765 metres high. There are 2 more volcanoes that are situated a little further away these are Acatenango and the fairly volatile Fuego, the latter of the 2 is a continuously smoking volcano that often erupts. There are some very pretty towns and villages within close proximity of Antigua and they are worth visiting, even simply to just pass through them as their historic churches and beautiful floral displays are a pleasure on the eye. The towns include Jocotenango, Ciudad Vieja, Santa Catalina Barahona and San Juan El Obispo. The city of Antigua has much to offer its visitors and residents alike. There are numerous fine restaurants serving delicious local dishes, internet cafes, museums, shops and art galleries. The Catedral Metropolitana is a fascinating historical cathedral it was constructed in the year 1543 and has encountered numerous earthquakes during its time being semi destroyed by many of them. 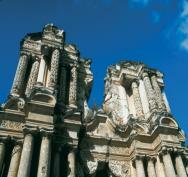 The cathedral has been partially restored now and displays its Spanish Architecture with pride. Description: Antigua is a city located in an unusual but stunning setting being overlooked by a volcano. The city is steeped in history that is just waiting for visitors to discover.